Although geared toward particular audiences, children of all ages are welcome at all storytimes. Recommended for ages 0 to 15 months, though children of all ages are welcome. Experience simple books, rhymes, music and play designed to promote development and learning. Explore the early literacy skills of singing, playing, reading and talking. Recommended for ages 15 months to 3 years, though children of all ages are welcome. Experience simple songs, creative movement, and short stories with your toddler. Explore the early literacy skills of singing, playing, reading, talking and writing. Recommended for ages 3 to 5 years, though children of all ages are welcome. Preschoolers will experience stories, activities, creative movements and songs more challenging than those featured in Toddler Storytimes. We explore the early literacy skills of singing, playing, reading, talking and writing in each storytime. Children of all ages are welcome; storytimes will be tailored for the age of the children present. Experience stories, creative movement, music and more. We explore the early literacy skills of singing, playing, reading, talking and writing in each storytime. Enjoy stories, crafts, and activities with children's book characters! Don't forget your camera! Meet dads, male caregivers and their children for stories, songs and crafts. It is a great opportunity to meet other dads and to have fun with your children. Explore the early literacy skills of singing, playing, reading, talking and writing in each storytime. Interaction and participation are encouraged. Children of all ages are welcome; storytimes will be tailored for the age of the children present. Recommended for ages 3 to 5 years, though children of all ages are welcome. Preschoolers will enjoy stories, activities, creative movements and songs more challenging than those featured in Toddler Storytimes. Interaction and participation are encouraged as good preparation for formal preschool and kindergarten classes. Explore the early literacy skills of singing, playing, reading, talking and writing in each storytime. Music & Movement focuses on literacy through song, dance and play designed for active toddlers and their participating caregiver(s). Join us at different parks and places in the Omaha metro area for storytime, featuring stories, creative movement, music and more. 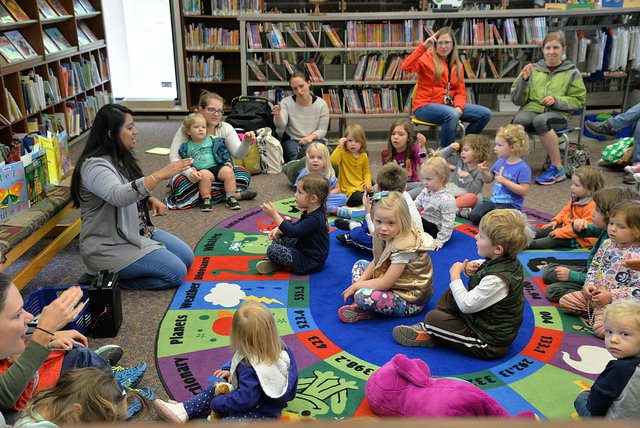 Storytime is geared toward preschoolers, but all ages are welcome. Rain or shine, we'll be there! View frequently asked questions about storytime.